All bee larvae eat royal jelly when they're new, but only future queens continue to eat it. To figure out why, researchers in Austria are taking a close look at the molecular ingredients of the fancy fare. Katharina Paschinger's father, a conservation chemist in Vienna, was a devoted beekeeper. Paschinger remembers fondly that he would bring royal jelly, an important food for bee larvae, as a gift on visits to her maternal grandmother. "He would feed it to my grandma and tell her it was for long life and beauty," Paschinger said. "And actually, she lived to be 98." Royal jelly is widely believed to have health benefits, although the medical evidence is scarce (and doctors caution that some people have severe allergic reactions). One thing the substance certainly does is promote caste development in honeybees, causing genetically identical larvae to develop into very different adults. 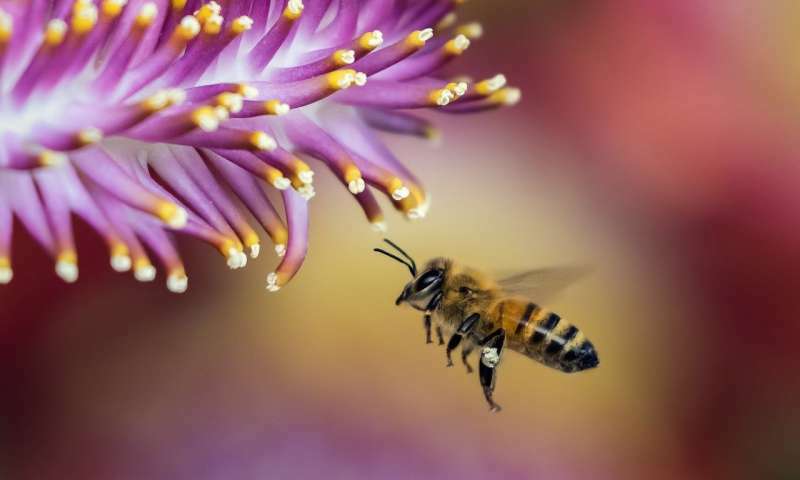 All bee larvae eat royal jelly secreted by worker bees for the first few days of life, but those picked out to be queens continue to eat it until they pupate and beyond, whereas those that will become workers switch to honey and pollen. Biologists believe molecular signals in royal jelly drive larval bees to develop into queens, but the details of that signaling—including what molecule is most important and how it is recognized—are not yet clear. Questions along that line brought Katharina Paschinger, a chemist, to revisit royal jelly this year in research published in the journal Molecular & Cellular Proteomics. Paschinger and colleagues in Iain Wilson's lab at the University of Natural Resources and Life Sciences in Vienna focus on glycoproteins, proteins to which a chain of sugar molecules is attached. These sugar chains, called glycans, can dramatically affect proteins' binding and signaling activities. Previous studies of royal jelly glycoproteins had mostly found classes of glycans known as oligomannosidic and simple hybrids. As these contain no special recognition elements, they could not explain the unique effect of royal jelly on larval fate. But Paschinger, her colleagues and some other scientists recently began to find more complex glycan structures in several insect species, such as mosquitoes and moths. Their data, Paschinger said, challenged "a really long-held belief that insects only synthesize oligomannosidic glycans. You see these statements everywhere. It's a nightmare to read such simplifications." The diversity in other insects' glycans was a reason to suspect that royal jelly glycoproteins also had hidden depth. Royal jelly, available in bulk at health food stores, was a good candidate for a combined glycomic and glycoproteomic analysis, said first author Alba Hykollari. "If you have a sample and you want to start with glycomics, the first question is how much you have and how pure is it. We were quite lucky: We got a lot of royal jelly, and it was very pure." To determine the structure of the glycans in royal jelly, Hykollari used enzymes to isolate the glycans from proteins and added chemical tags. She separated the tagged glycans using liquid chromatography and analyzed them using a mass spectrometer, an instrument that breaks molecules into smaller pieces and separates them by size and charge. Paschinger analyzed the data to draw conclusions about the glycan structures. First, she compared fragmentation patterns to precursor molecules, making inferences about the glycans' structures from how they broke apart. Then, she suggested specific chemical or enzymatic treatments to test those hypotheses. Because glycans are modular chains, like Legos, breaking off one unit at a time can give a good idea of how the whole fits together. For example, phosphoethanolamine, a subunit the team observed in royal jelly, blocks digestion by some enzymes, but it can be removed using hydrofluoric acid. If glycan fragments of a certain mass appeared after treatment with hydrofluoric acid, it was a clue that phosphoethanolamine was present. "I would say that the N-glycome of royal jelly was definitely underestimated," said Hykollari. Of the approximately 100 glycan structures the team defined, many had not been observed before in bees. Their laboratory's exclusive focus on glycan biochemistry and their extremely sensitive mass spectrometer helped the research team determine the identity of scarce glycans, said Hykollari. "We have worked (on glycans) for many years, so I would say our workflow is optimized." Knowing these structures could help future scientists understand the activity of glycosylated proteins in royal jelly—either how they designate larval bees as future queens or how they trip allergic alarms in the human immune system. For example, said Paschinger, a researcher could synthesize a glycan from royal jelly to see how it interacts with signaling proteins in the larva. Their own plans moving forward are to tackle the glycome of another species. "Our driving force is understanding glycoevolution," said Paschinger. "But very often we're also driven by the element of challenge." The research team dedicated their manuscript to Paschinger's father, the chemist-beekeeper. "I am sure he would have been very happy to see something scientific come out of his beekeeping hobby," said Paschinger.